Some people snore because of their sleeping position. 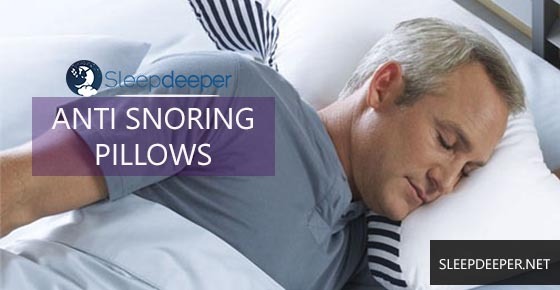 If you are in this lot of snorers, then anti snore pillows will be an ideal solution for you. These memory foam pillows are made in such a way that they raise and align your head, therefore opening your airways. This helps to stop snoring. Anti snoring pillows are made of hypo allergic material. The material is safe for use, even by extremely sensitive individuals. Most brands of the pillows come in standard form. So, you don’t have to worry about purchasing newer pillow cases. Usually, the challenge is knowing which brand is authentic and will be effective and which is not. This is why we have done all the hard work for you. Read on. If you need a natural yet effective way of dealing with snoring, consider getting any of the following snore pillows. This is one of the best pillows that we stumbled upon. Not only is this pillow hypoallergenic, it is also handmade and looks beautiful. Designed by Science of Sleep, the Snore No More Starter Pillow has been proven to stop snoring. This pillow is designed to realign your head and keep the chin off the chest. This helps to keeping your airway open as you sleep. This pillow will therefore help you attain a good sleeping position and consequently, sufficient rest. The first day you use the pillow, you will probably find it uncomfortable. However, once you get used to it, you might be addicted to always sleeping with it. Like other normal pillows, you will need to replace this anti snore pillow every 4-6 months as it is prone to wear and tear. Made of 100 percent polyester (non-tex), this high density hypoallergenic memory foam pillow is meant to support your side and back. The Viscofresh Memory Foam pillow comes with neck bolster to provide support for supine sleepers and cradles side sleepers’ back. This ensures their air passage is open during unconscious sleep. The pillow also has natural green tea and other plant-based ingredients that help fight odors. With the snoring pillow, not only will you have comfortable sleep, but will also breathe clean air. You will wake up feeling fresh and energetic. The pillow stands out from the others by virtue of being adjustable. Adjusting the snoring pillow only requires removing any of the 3 supporting pads in the removable easy-to-wash cover. This pillow has been scientifically proven to be effective in eliminating snoring for both people that sleep on their backs and those that sleep on their sides.